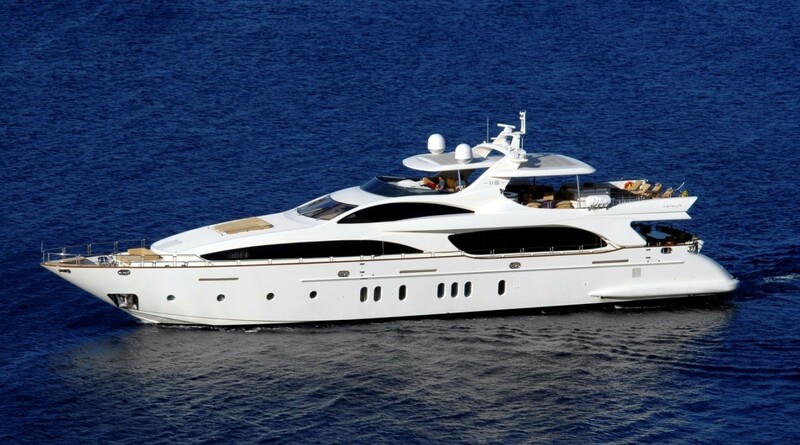 Motor yacht HAPPY HOUR (ex LA DEA), meaning ‘goddess’ she was designed by Stefano Righini Designs and built by Azimut yachts in 2004, and underwent a refit in 2008. 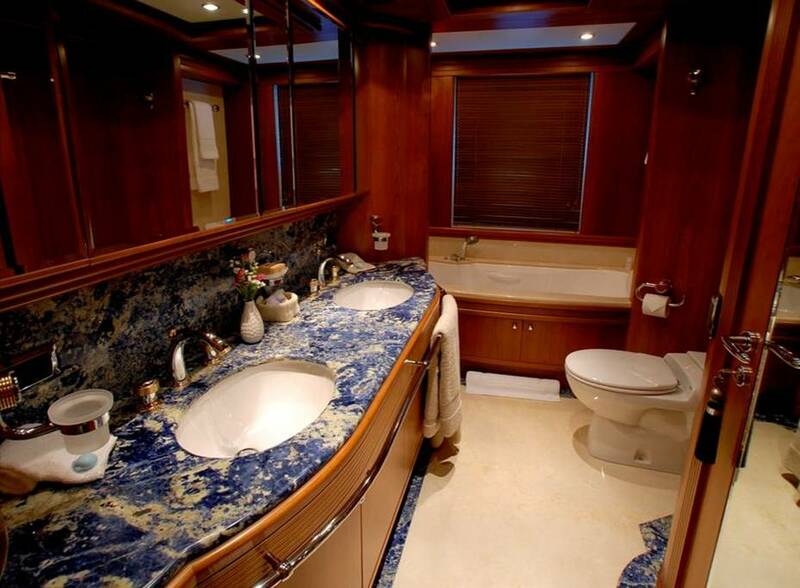 The yacht measures 35.3m (116ft) and boasts a well-appointed layout with amenities usually found on larger yachts. 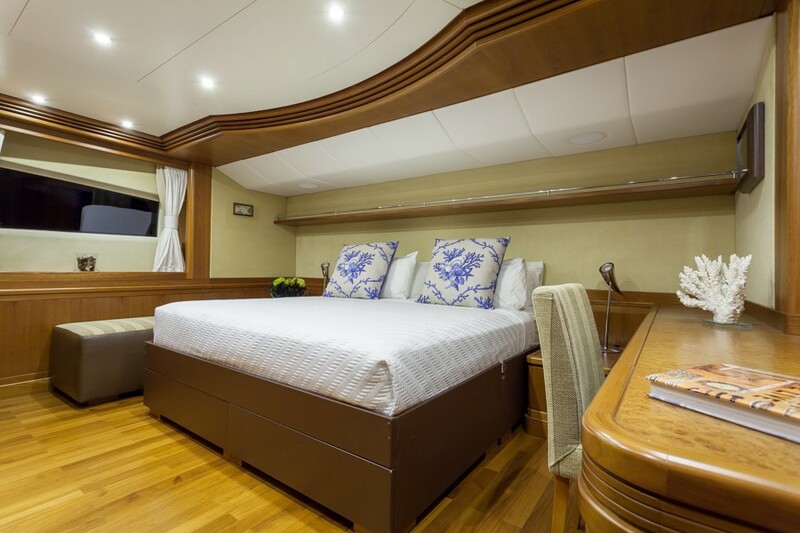 Accommodation is provided in 5 cabins, for up to 10 charter guests. 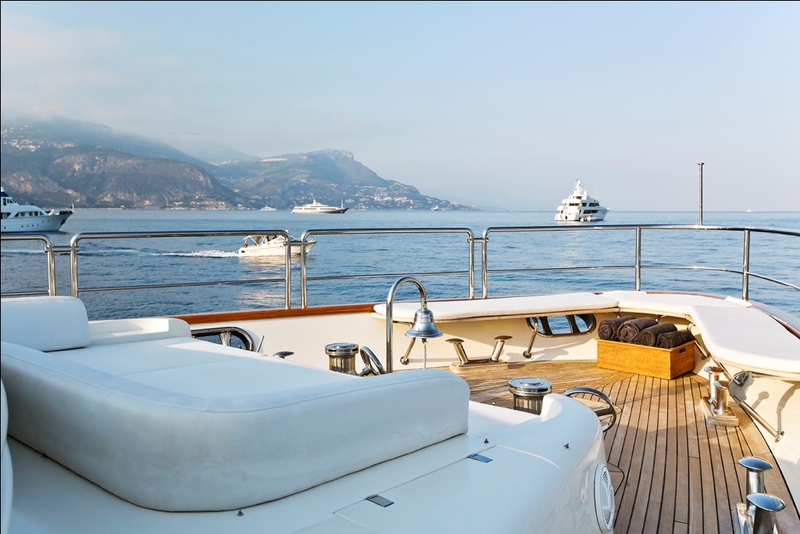 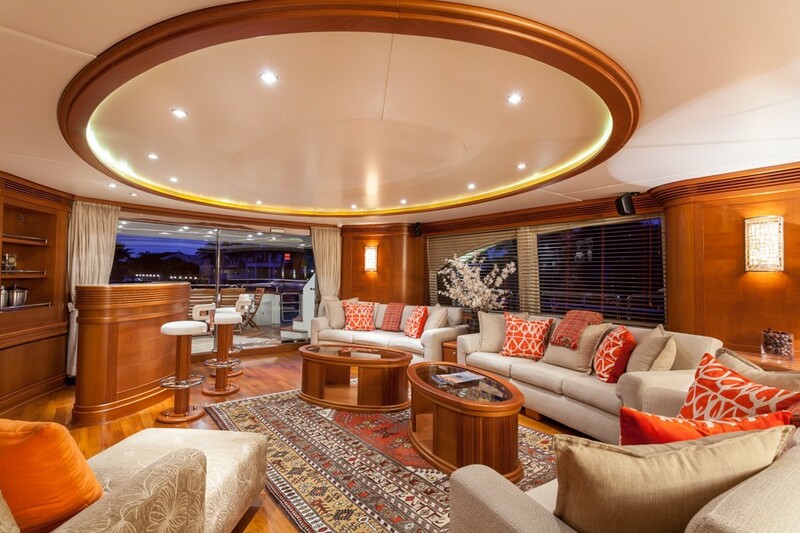 Charter yacht HAPPY HOUR has an elegant and generous interior with design by Carlo Galeazzi featuring warm-toned wood, neutral soft furnishings and state of the art technologies. 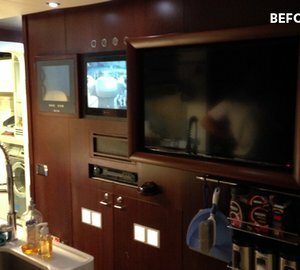 The salon has a casual yet sophisticated ambiance. 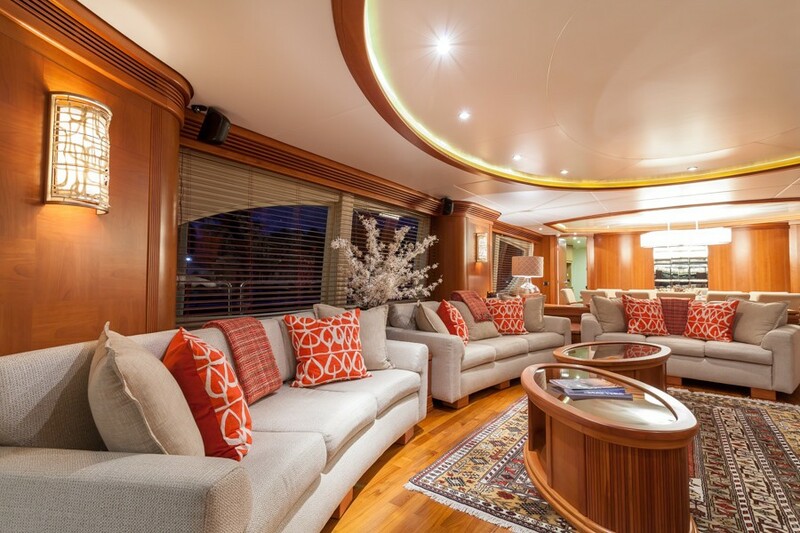 Plush sofas invite guests to relax and unwind, perhaps with a cold cocktail from the wet bar, or catch up on the latest movies on the pop up flat screen TV. 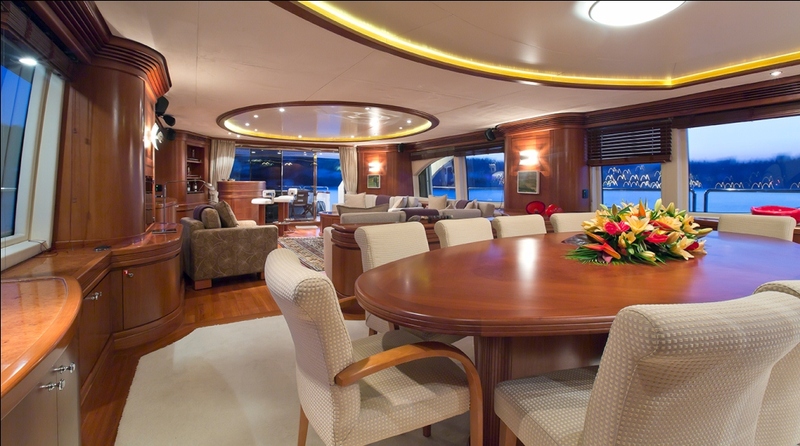 Forward of the lounge space, a formal dining table seats all 11 guests comfortably. 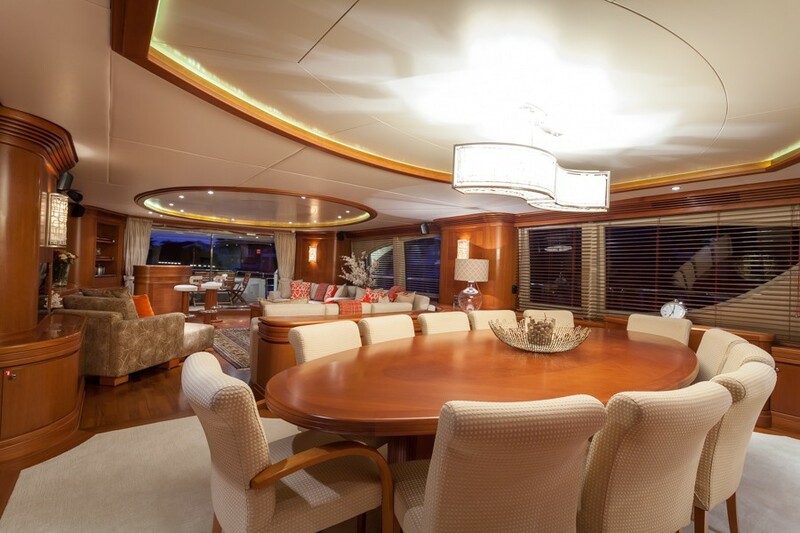 The salon and dining area are flanked by panoramic windows creating an open airy feel with the world outside. 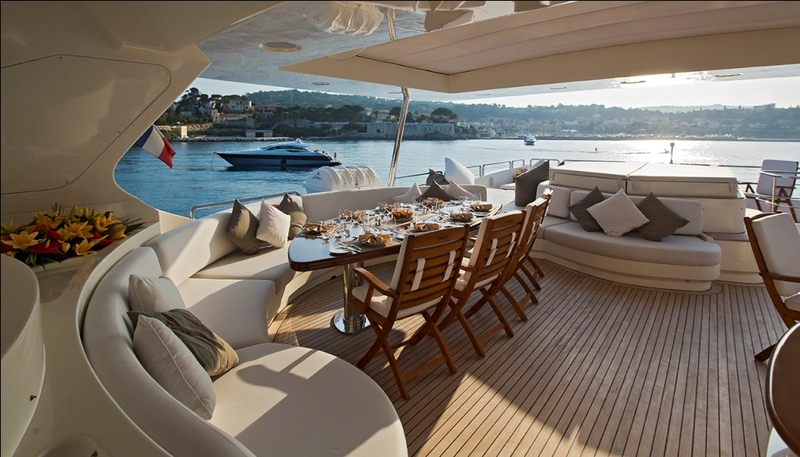 Optional shades ensure ultimate privacy on demand. 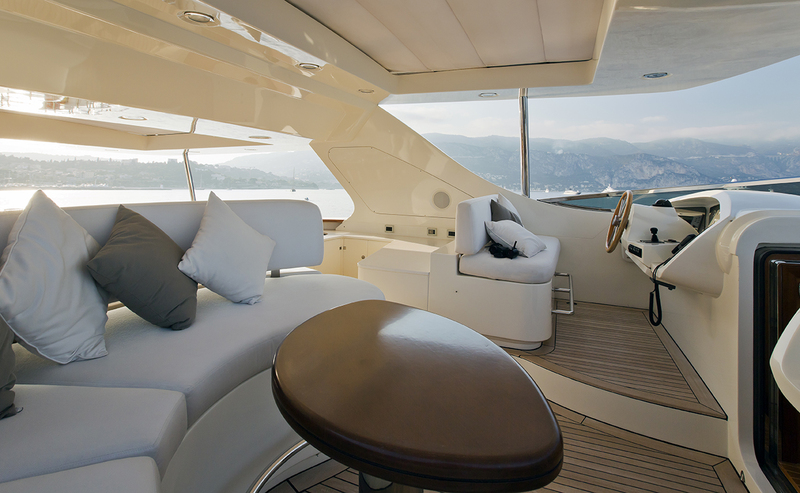 The Azimut 116 HAPPY HOUR has ample exterior living areas to enjoy, from her large transom to her incredible sundeck. 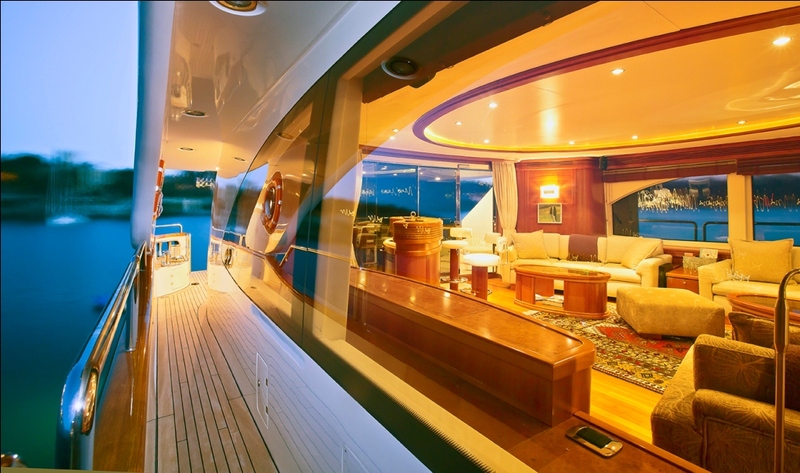 Aft of the salon sliding glass doors lead onto a shaded teak deck with an alfresco dining option and additional seating. 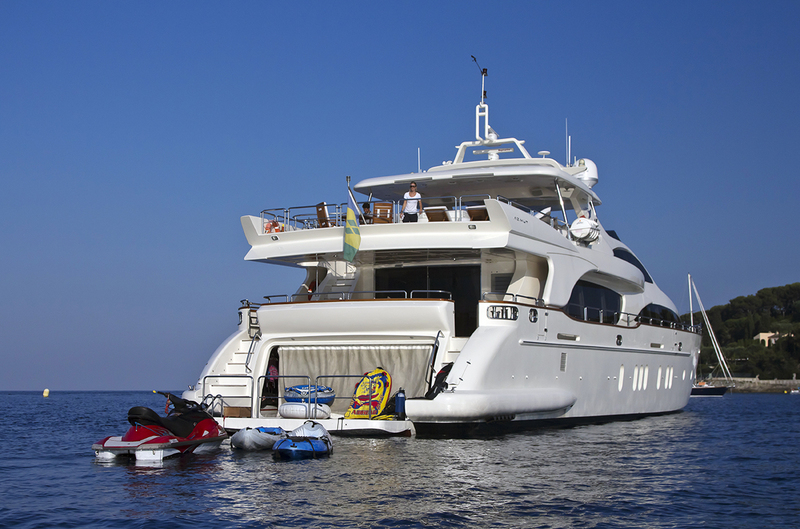 Steps on port and starboard give access to the swim platform and water toys garage. 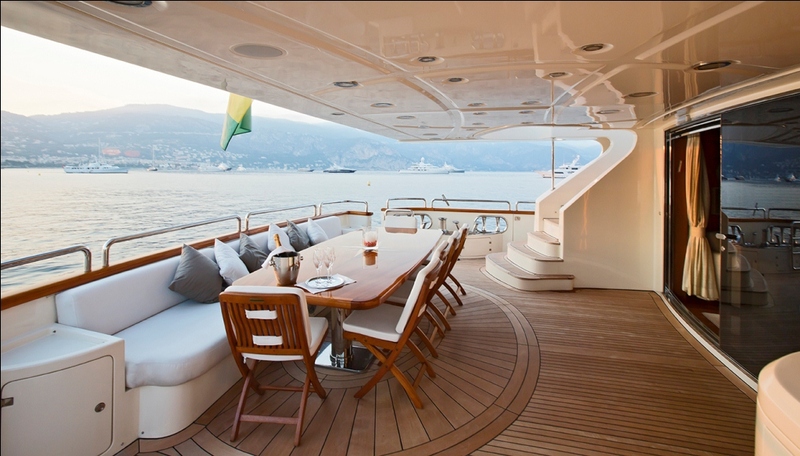 Wrap around decks with varnished cap rails and stainless hand rails make enjoying the sunpads forward easy. 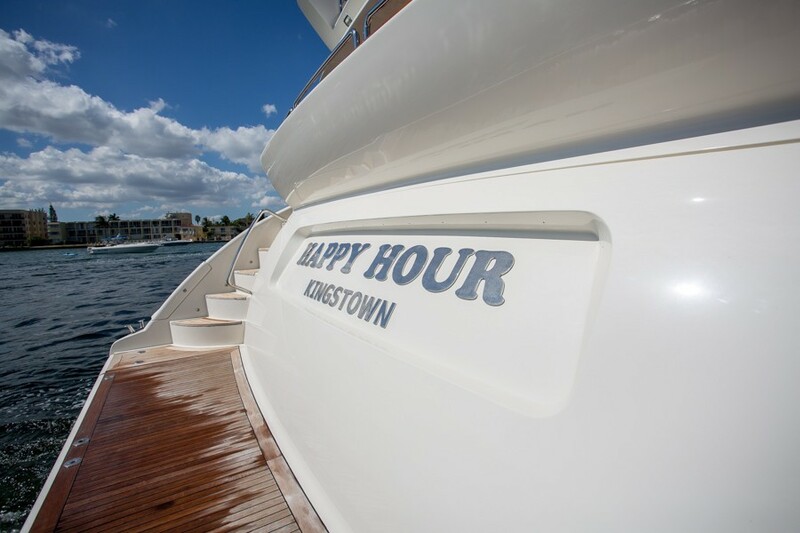 Above the main deck, HAPPY HOUR’s flybridge offers something for all to enjoy. 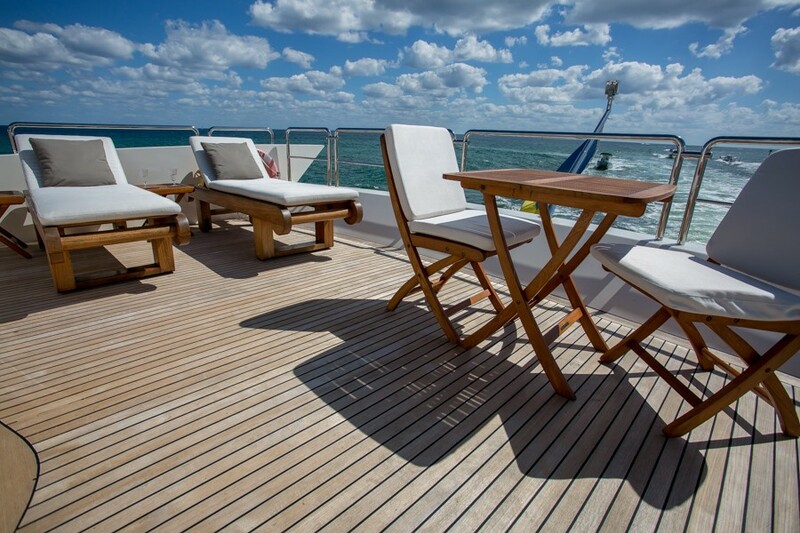 The sun worshipers have plenty of space with chaise lounges and sunpads. 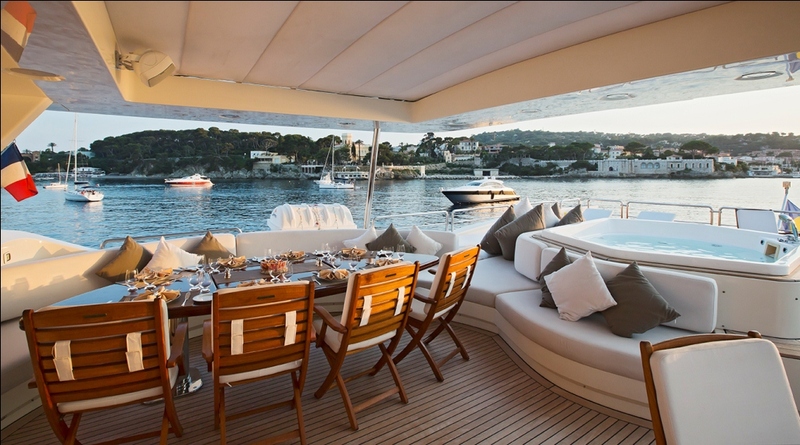 An alfresco dining option is ideal for breakfast, lunch or a private dinner. 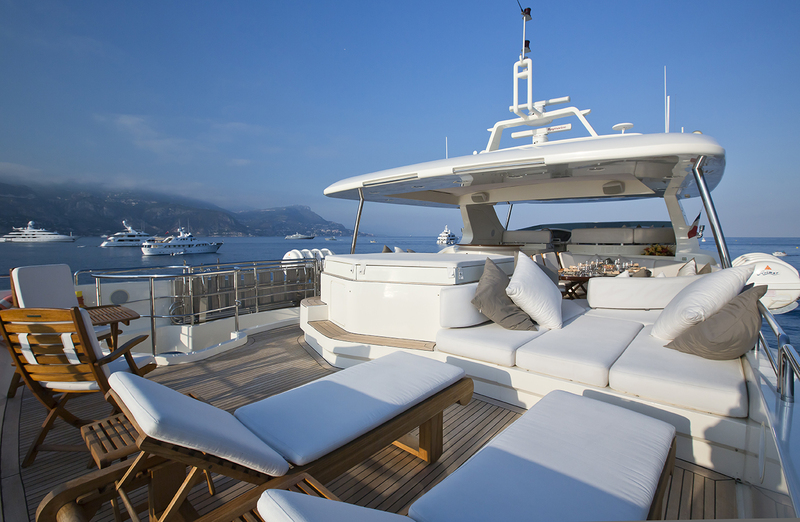 Additional seating, cocktail tables, a wet bar and Spa Pool tub ensure everyone’s optimum comfort. 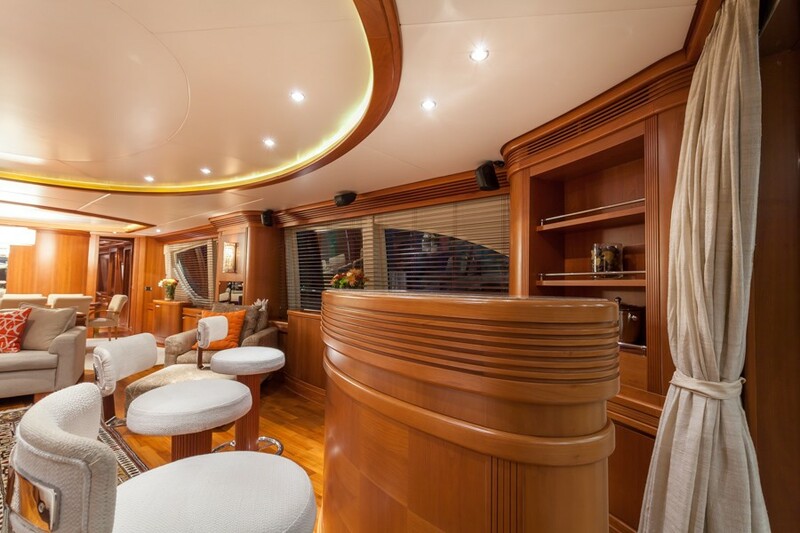 Overhead there are 2 retractable Bimini shades. 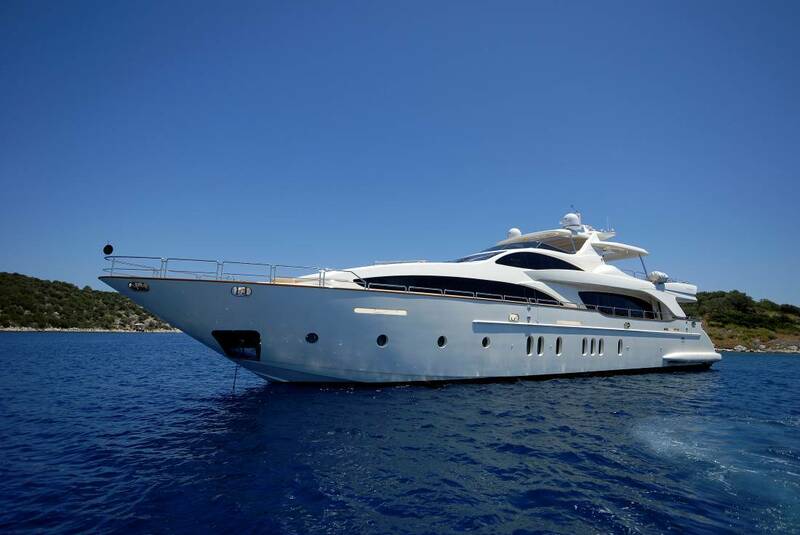 Motor yacht HAPPY HOUR (ex LA DEA) has a beam of 7.4m (24.2ft) and a draft of 2.6m (8.8ft), the semi-displacement GRP hull boasts speeds of 18 – 23 knots powered by 2 MTU 2000HP engines. 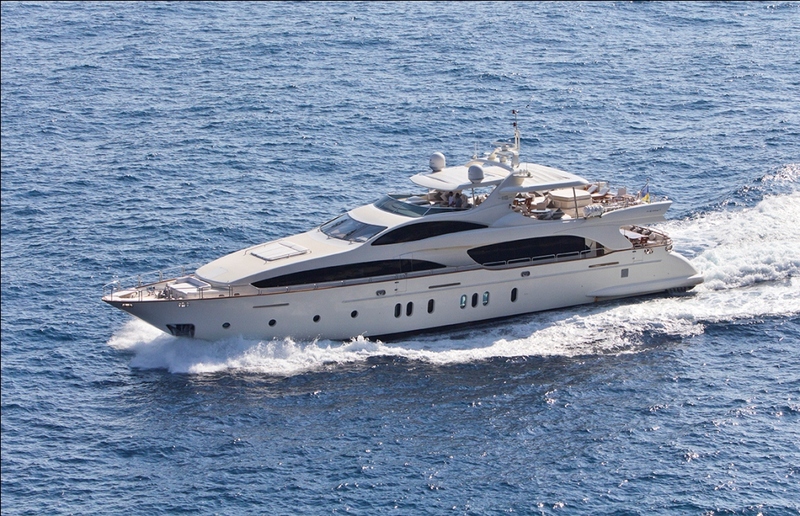 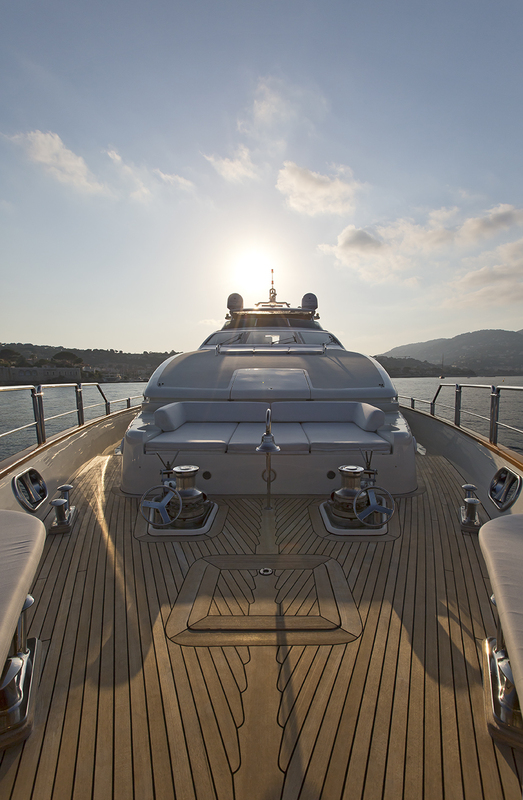 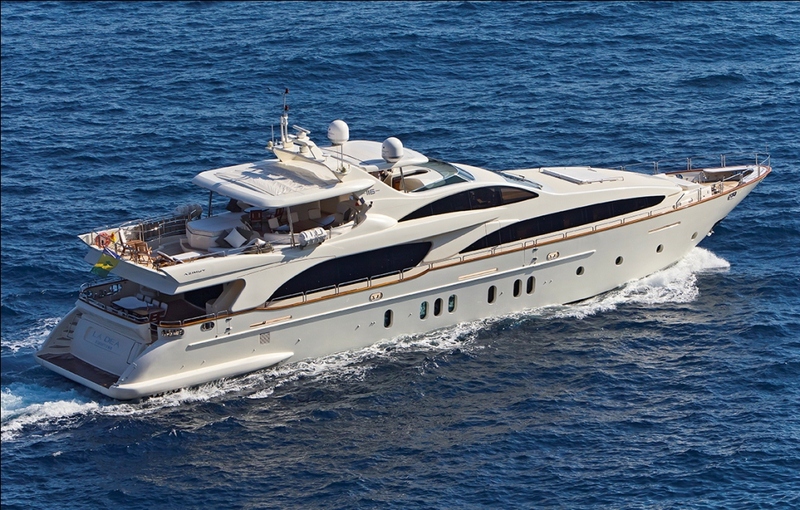 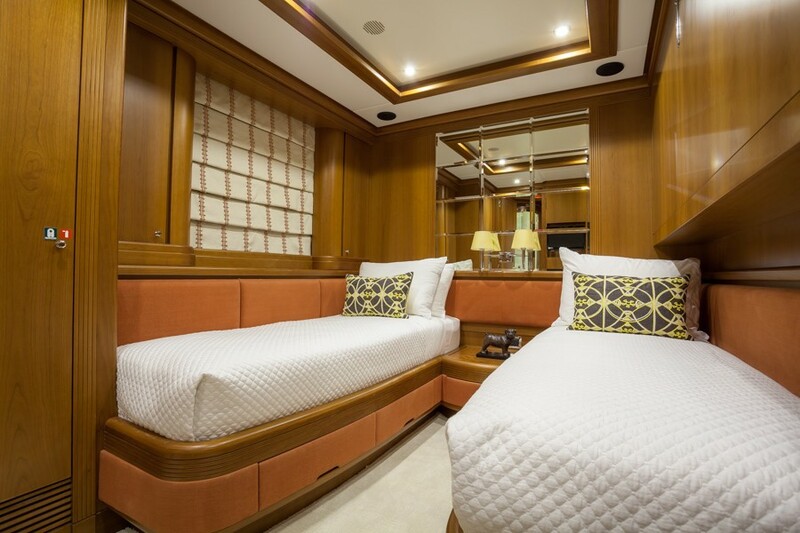 Luxury motor yacht HAPPY HOUR can accommodate up to 10 guests in 5 deluxe cabins. 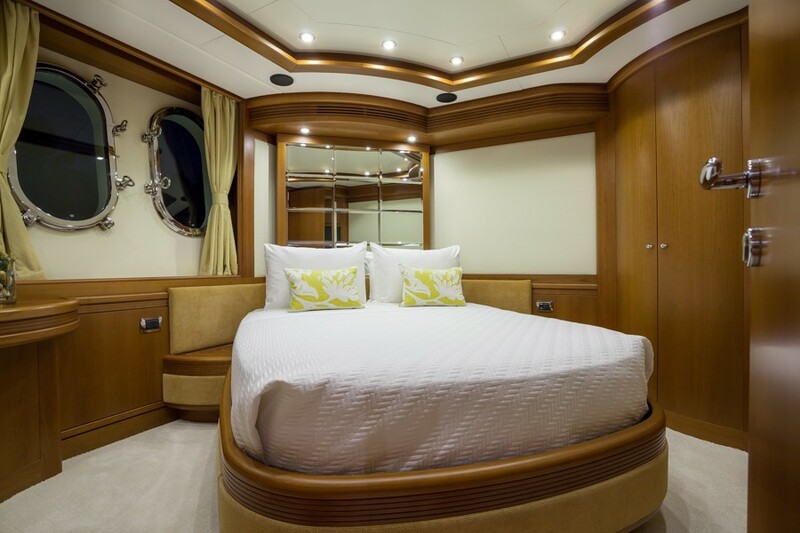 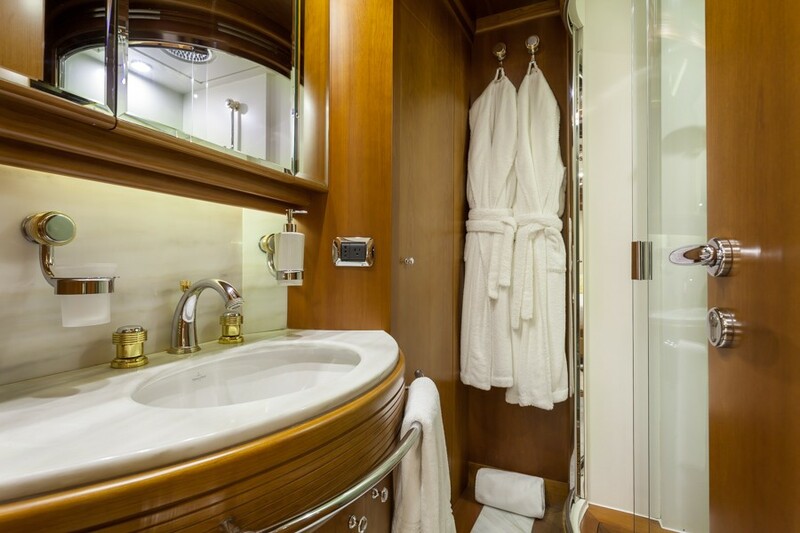 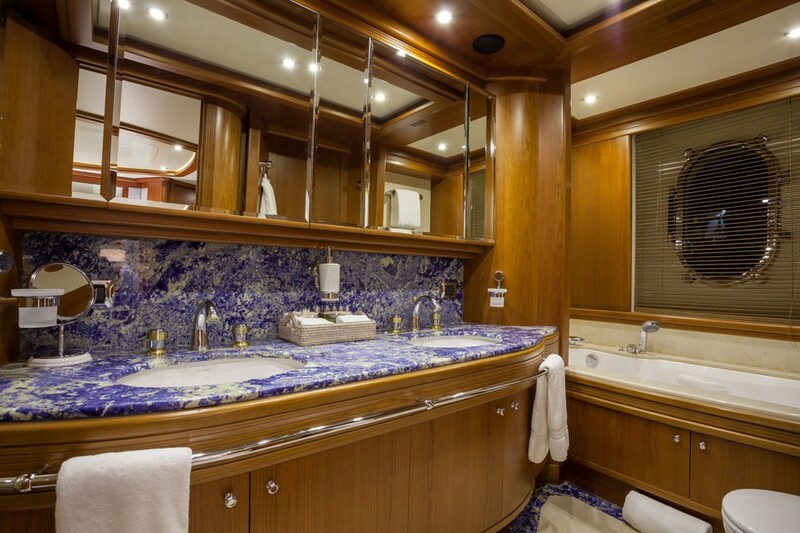 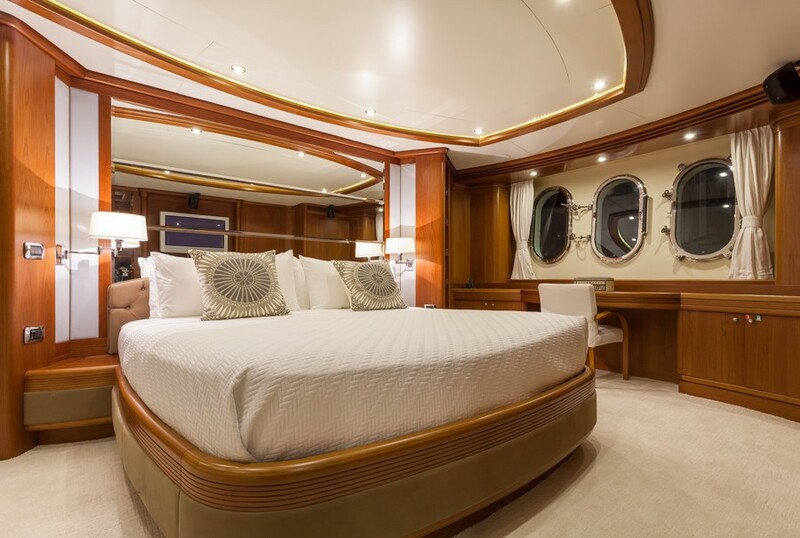 The master stateroom is below decks and full beam of the yacht amidships with a king size center lined bed, private seating area, vanity, walk-in wardrobe and en-suite facilities with his and hers sinks and tub. 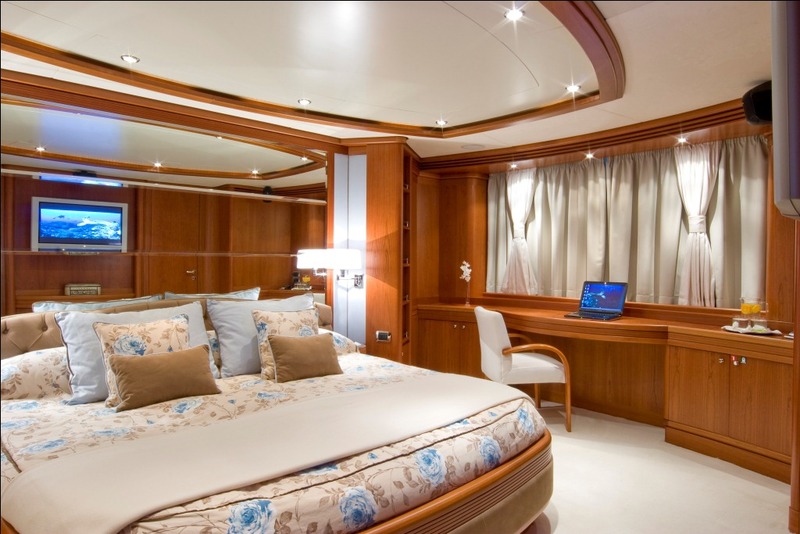 Forward of the master are 2 double guest cabins and a twin guest cabin with Pullman berth, all 3 cabins offer en-suite facilities. 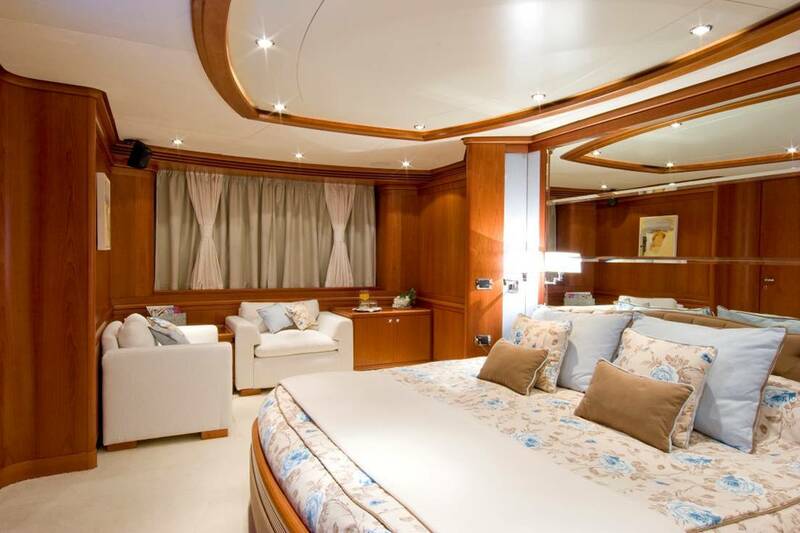 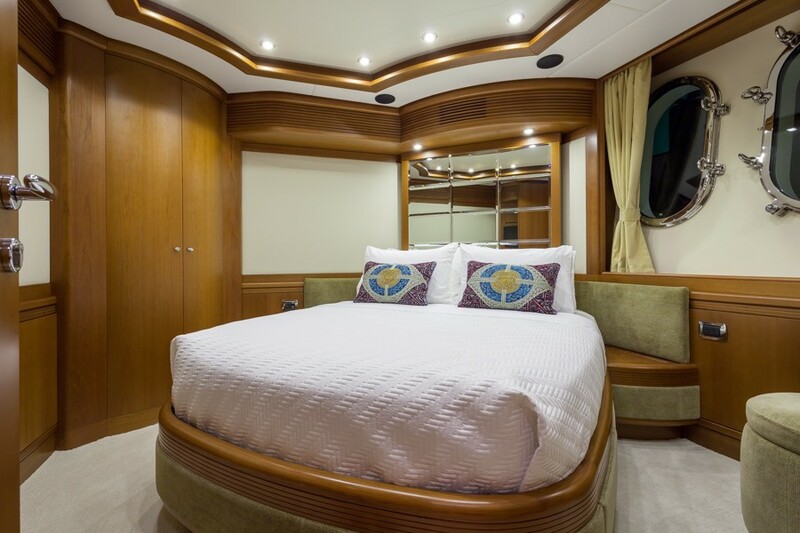 On the main deck, a VIP cabin offers a full beam cabin with double bed and en-suite facilities. 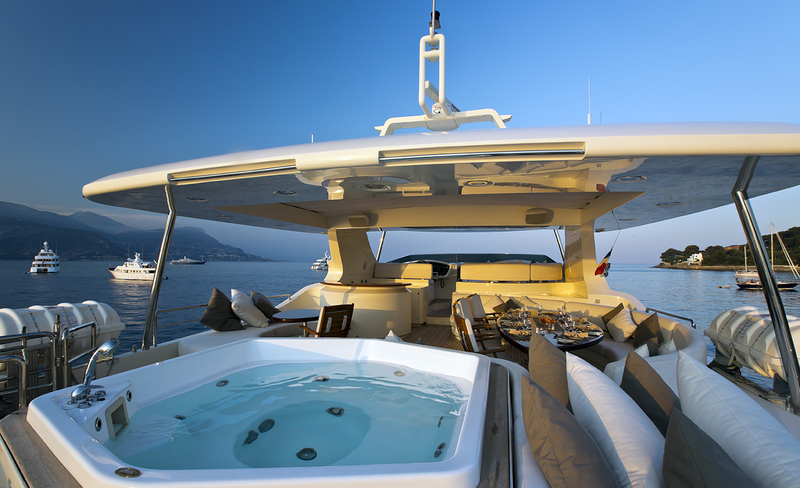 Tenders & Toys onboard the Azumiut 116 yacht HAPPY HOUR (ex LA DEA) include a 5m Novorania tender with 160hp inboard engine, 2 Sea kayaks, 2 Doughnuts, Wake board, Water skis, Kawasaki 250hp jet-ski - 2 seaters, Snorkelling equipment, Play station 2, Diving equipment such as tanks, compressor... RYA center since 2012 - jet ski licence can be delivered on board by crew member after training session. 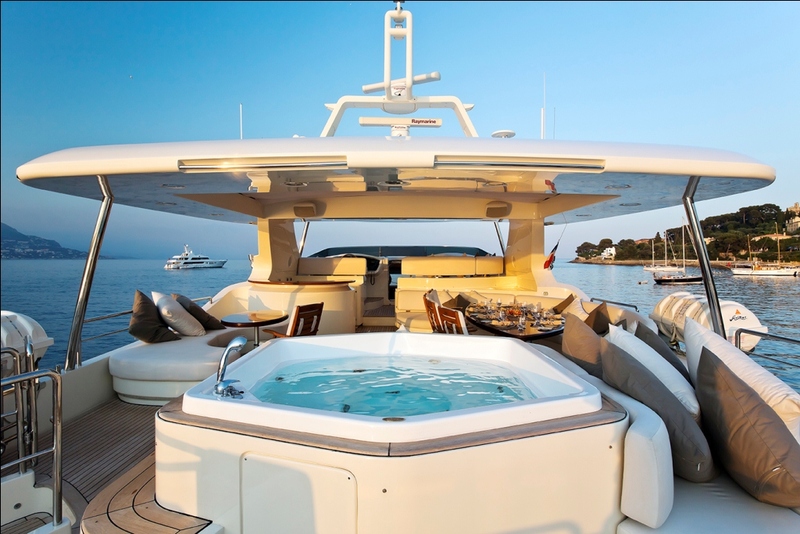 Audio Visual Equipment and Deck Facilities include Sky satellite TV, TV/DVD/Sat throughout the yacht and in all cabins, Spa Pool for 2 persons on sundeck, Portable BBQ can be set up on swimming platform.